VIX and More: How Can the VIX Be 14 and Lower than VIN and VIF? Many novice and advanced VIX followers are scratching their heads today, wondering why the VIX is down more than 5%, hovering around the 14.00 level, when the SPX is down 0.4% and all the major market averages are deeply in the red. More serious students of the VIX will also note that this drop in the VIX comes on a Monday, when the typical VIX “calendar reversion” is generally responsible for about a 1% pop in the volatility index. 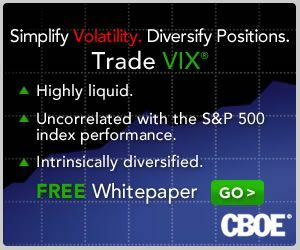 CBOE maintains indexes that track the level of implied volatility from single SPX maturities. Getting back to the roll, the SPX options contract months roll forward one month today, so that the nearer-term month (VIN) moves from August to September and the farther-term month (VIF) moves from September to October. More importantly, per the bolded text from the VIX white paper above, today’s VIX calculations sum more than 100% of the VIN and a negative number for VIF. This is the reason why the VIX is less than the two components used in its calculation: VIN and VIF. In summary, the bigger the difference between the VIN and the VIF (and right now that difference is a very large 9.4%), the more likely the VIX is going to be substantially depressed following the VIX roll. Also, as we move toward the expiration of VIX options on August 22nd, the distortions from the negative VIF component used in the VIX calculations should gradually diminish, as the VIF weighting moves toward zero and then becomes a positive number. For those who are interested in delving into the nuances of the VIX calculations, the CBOE’s VIX White Paper is the best place to start; the links below might also provide additional insight.